Compare Mobile price and Specification in India. Get the latest price and information of mobile phones in 2018, and decide on which one you may want to buy. 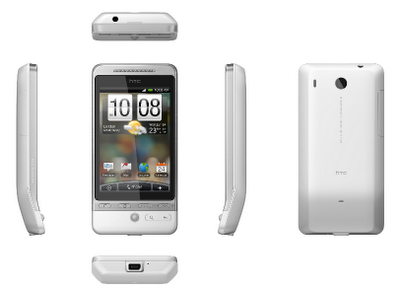 HTC has announced its third Android powered smartphone HTC Hero. HTC hero is also uses Android OS 1.5 which was used in like HTC Dream and Magic, but has some better hardware features than previous phones. HTC Hero specification includes a Qualcomm, 528 MHz processor with 512 MB ROM and 288 MB RAM. It is the first Android powered smartphone to include a 5 mega pixel camera and Adobe Flash support. HTC Hero has one of the largest display among existing Android phones, and that makes it an ideal device for internet and multimedia experience. HTC Hero launch date in Europe will be around July and will eventually rolled out in Asian countries and Americas. Price is yet to be disclosed, but here you can check out the photos and specification of this smartest entry into Android phone market . 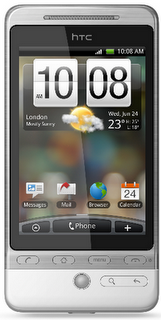 Available in while and black colors, HTC Hero is known as worlds first Android smartphone with customized user interface. This phone is built for long lasting durability and operation . Its 3.2 large HVGA display (320*480)has anti-fingerprint screen coating and is one of the first phone to provide Teflon coating on its outer surface for looks and rigidity . As said earlier , HTC Hero includes a 5 mega pixel auto focus camera which is capable of recording videos upto a maximum quality of 30 fps . Flash support for playing internet videos . Communication facilities like Bluetooth ,Mini USB ,WiFi are supported . GPS with Google maps , digital compass, gravity-sensor for navigation . Weighing 135 grams ,HTC Hero includes a 1350 mAh Lithium-ion battery which is capable of providing a GSM talk time of 450 minutes . Supports popular video and audio formats like MP3, AAC(AAC, AAC+, AAC-LC), AMR-NB, WAV, MIDI and Windows Media® Audio 9 MPEG-4, H.263, H.264 and Windows Media® Video 9 etc . New HTC technology called HTC Sense makes it possible to arrange all phone possibilities like email, photos, internet, communication, social media sensibly for the easy work life of the people HTC sense debuts in HTC Hero smartphone . These are some features of HTC sense . Arrange phone widgets or user interface as per the interest of the user. A new profile feature called scenes enable users to create customized phone appearance based on their preference. HTC sense makes it easy to stay upto date with friends in social media through Twitter, Facebook updates, Flickr and many other services arranged in one place . HTC and Airtel recently launched HTC magic phone in India . HTC magic is price around 30000 INR . So being a 5 mega pixel phone with large display and multimedia features, HTC Hero will probably touch Indian market with a price rage around 33000 INR (650-730 USD) . Update : HTC announced Hero in India. It will cost 34,600 (720 USD) in Maharashtra and 32000 (660 USD) INR in other Indian sates. As a part of the launch, Airtel announced Hero data plan with 100 MB free internet usages each month for a period of 6 months . Update: Vodafone announced Cheap HTC Android phone Tattoo for its customers in India . Update: HTC announced a new Hero alike smartphone called HTC Legend. HTC Legend has metal body finish and a new HTC Sense UI. Dope phone but cost to much!!!!! I plan on purchasing this phone come December when it finally becomes available here in the U.S. I am also happy to have read today that they are soon releasing a firmware update to fix the sluggishness that had been reported in reviews. I do have one major concern. I am switichin gover from Windows Mobile. I am a big Microsoft supporter but I just couldn't deal with Windows Mobile anymore. I did like however how I could sync my contacts and Live Mail account with my phone effortlessly. Is there any app available or in the works to support Microsft Live Mail and contact sync? I do not really use my Gmail account. And I have read about the forwarding option.. But I'd really just like to be able to put my preferred E-mail account on this lovely phone. Come hang out at http://www.HTC-Hero.com and thanks for reading.